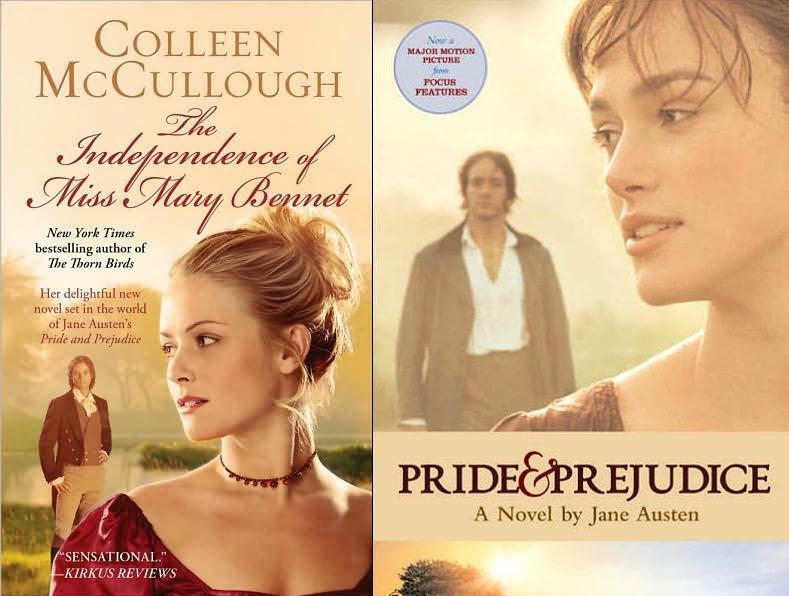 Trai also noticed a similarity between the paperback cover and another familiar P&P-related image. In fact, she made a side-by-side comparison to show us all. Click on the thumbnail to see the full-size image. We’re sure it was a coincidence. 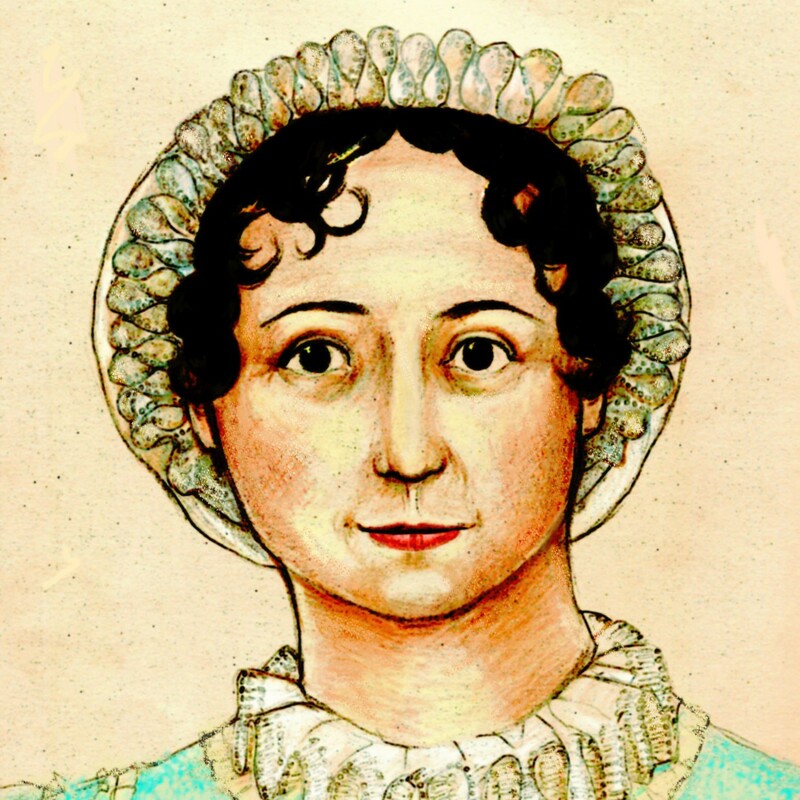 “Jane Austen’s iPod” on BBC Radio 4, Saturday, 10 a.m.
I’m sure a paperback edition was in McCullough’s contract, regardless of how well that atrocious book sold. Don’t mean to sound so bitter, but I’m tired of hearing about how the publishing industry is in a deathspin and yet books like this one continue to be marketed heavily while my Borders doesn’t even stock Murder at Longbourn. How dumb is that? Well Jane! You’re just going to the wrong bookstore! Try the other one, You know, with the initials B&N in the name. ;-)If it’s not on the shelf, they will happily order it. Sadly, the publishing industry is in a tailspin. Tough times for booksellers too with the demise of Borders in the UK and the independent bookstore fading away. So sad. In these tough financial times, I have noticed that publishers are more narrow in their focus sticking with and promoting established authors or themes that have performed in the past. Colleen McCullough’s books sell based on her reputation. Most will pick up The Independence of Miss Mary Bennet expecting another Thornbirds. Boy are they in for a suprise. Astute observation on the similarities on the two covers. I barely gave the new cover more than a glance when it hit my store. It is definitely a copy cat, and, they forgot to give her ginger hair and violet eyes! That would have made all the difference. That trip to Barnes & Noble was discouraging on many fronts. Not only was I shocked upon seeing the book in paperback, but as I was browsing the books in the clearance sale, there were books that were barely a few months old in there. I saw at least four or five books that were originally released this November marked down to 50% off! I wonder if it’s because they ordered too many copies, or if hard copies of books just aren’t selling as much with the Kindle and the Nook on the rise. Yes, B&N will still order for their customers. Borders won’t. Customer service is the name of the game, but margins are so wafer thin I guess B can’t afford to process my order anymore. Nooo! E-readers can’t take over! It is literally a nightmare of mine; bookstores closing, books being bought only online. I thought the episode of Doctor Who “Silence in the Llibrary” proved that paper books are still in demand even in the 50th century. Come on people. The wonderful tactile experience of curling up with a book- not a bit of e-waste- is incomparable. I am a pretty dedicated ebook reader, yet I still buy paper books, too. Not as many as I used to, granted. But I’ve never understood the “tactile” argument. When I’m caught up in a book, I’m not noticing the media delivery method. I’m just enjoying reading it. Publishers and booksellers are having a lot of difficulty understanding how to make and sell ebooks, in any event. But it’s not an all-or-nothing proposition and is not likely to become one. I can see ebooks replacing mass-market paperback books in five to ten years (though the readers have to come down a LOT in price before that happens), but hardbacks aren’t going away any time soon. I purchase both book versions of the same title sometimes. It’s magical for me to have a library of books at home or carrying one or two when travelling with a large suitcase. When I have to pack lightly or just carry a small purse, I enjoy being able to carry and choose from among 15 of my favourite books on my iPhone (downloaded through Stanza and Iceberg), and annotating as I go along. I’ll take the monster mashups over THAT book anyway. Definitely not laziness. I was being sarcastic (shocking, I know) when I said it was a coincidence. I’m quite sure it was very much on purpose, and meant to appeal to those who enjoyed the film. Chosen by someone who had not read the book, I think. From what I hear (and no way am I ever going to read it), it takes place about 20 years after P&P. That is not a picture of a woman in her late 30’s. Thing is, the online booksellers are great if you know what you want. Bookstores (indies and chains) are great for browsing, and finding things New To You, Gentle Reader. It will be a puzzle to figure out how to incorporate the “bookstore experience” into ebooks and online bookselling. I think B&N’s nook e-reading device does that very nicely–if you turn on the wifi in the store, you can browse and sample and they even send you coupons. But how to do the same thing for independent stores? Another thing to replace is the personal experience of a bookseller finding things for you based on what you like. Perhaps online book discussion venues will be a partial replacement for that. It’s hard to say. That being said, Amazon’s “you might like this” feature sometimes does come up with some interesting suggestions. But I look for things that I’ve no intention of buying sometimes, just to see what it says, and if such searches figure into my suggestions, I get some really odd ones! At least Mary’s beau (hey, isn’t she supposed to be not that pretty?) is fully dressed. Definite laziness. I’m the model on the hardcover cover book. At least in Australia. Firstly they tried to get out of paying me. Secondly, when I was shown the mock up cover, which was uninspired, I figured the final version would be a lot better, but it was exactly the same. Besides from throwing together a few stock photos and giving it a purple haze, they did nothing else. It’s sad when I know so many struggling talented artists that could covers a hundred times better, that major publishing houses churn out such crap covers. Though, as a skint student I am guilty of giving Amazon my service as opposed to proper book stores. I guess when I can afford to, I will pay more so the authors get more from their efforts. I would appreciate this being a newbie author: maybe one day I will be published, and like to think that my efforts would not be hindered by tacky covers. And here I thought you were snarking about McCollough’s plagiarism woes. 😉 I once saw an interview where she insisted that the striking similarities between Ladies of Missalonghi and LM Montgomery’s The Blue Castle were “coincidence.” Though, of course, the author has nothing to do with the cover art.